10 CONWAY HEADS TO D.C. Above: Stephen A. Smith, a sports analyst at ESPN, will be coming to Lynn on Thursday, April 22. For more information, see the box office. Stock Photo. Above: This past J-Term, 1,069 students and faculty served more than 16 organizations for a total of 6,360 service hours to benefit South Florida nonprofits. LU Photo. With excitement swirling around them, these students will proudly show their films in front of a live audience. Students, faculty and staff are all welcome to attend in support of these young filmmakers. Food and drinks will be provided. Since its official opening, students have also come to appreciate the affordability of many of the menu items at Christine’s. “Not only does [Christine’s] have great food, but it is priced competitively with many other restaurants off campus,” said Natalia Narvaez, senior. With a multitude of options from which to choose, Christine’s offers a unique dining experience for students, faculty, staff and even outside parties as well. Keeping its goal to create an inviting atmosphere in mind, the restaurant appears to have succeeded in its initial weeks of existence. Above: Christine’s serves a variety of tasty treats including pastries, fresh fruit, meals, snacks, coffee and much more. Staff photo/S. Lasprilla. Above: As course registration opens, the advising center works with students to coordinate online classes, in-person classes and other commitments. LU photo. perfect fit. For residential students, though, the desire to meet new people and experience a personalized approach to learning, on-ground courses would be ideal. “I like in-person courses better. The connection you make with each professor allows them to personally get to know you and your learning style,” said Antonio Postorino, senior. “From that, they can alter how they teach to what suits each student best.” The key to picking courses, ultimately, lies in understanding one’s learning preferences. Due to numerous benefits associated with both online and on-ground courses, students are sure to grow within each environment. In fact, the opportunity to enroll in both types of classes simultaneously is likely the greatest perk for students. For those looking to learn of the courses available for the upcoming school year, visit coursesearch.lynn. edu or contact the assigned academic advisor. Above: This year, students have the option to register themselves online via MyLynn for the upcoming fall and spring semesters. LU Photo. offering a plethora of other incentives to join alongside its program. “Students report improvements in their college experience when they have utilized counseling services,” said Patrick. “We support the faculty and address any of their student concerns, working with various departments on campus to provide programming about mental health issues.” The Counseling Center welcomes any input from students on ways to improve its services. To learn more about the Counseling Center, call 561-237-7237 or visit its tab on myLynn. Above: Patrick, a licensed psychotherapist, focuses on achieving student success via the counseling center. LU Photos. Above: Schneider encourages other students to get a head start in their career as well. She advises students to stay organized with a planner and stick to a specific schedule. Photo/O. Schneider. I take all of my classes online,” said Schneider. “My typical day includes waking up at 7 a.m., grabbing my Starbucks [coffee], heading into the office, coding emails and making edits to the school website.” Hoping to encourage others to follow in her footsteps, Schneider continues to offer useful tips to students seeking expedite their school as well. “Buy a planner, wake up early and have a schedule you actually stick to,” she said. “Above all, be hard on yourself, but also be your biggest fan. Don’t forget to have a great support system that picks you up should you doubt yourself.” As she prepares to complete her second degree program in the span of three years, Schneider is eager to take her skills to the real world upon graduation. Above: The New Jersey native took 20 classes in an academic year to be able to graduate with a bachelorâ&#x20AC;&#x2122;s degree in two years. Photos/O. Schneider. Above: Conway enjoys exploring the capitol’s monuments, coffee shops, museums, memorials and art galleries alongside his friends. Photo/W. Conway. the Capitol, speaks with constituents regarding their concerns and completes basic office tasks. When Congress is in full session, Conway often finds himself physically running things to the cloak room, drafting mountains of memoranda on policy and resolutions as well as assisting the legislative staff with policy research. “Interns on the Hill do a little bit of everything,” said Conway of his position. Outside of work, Conway enjoys wandering through local bookstores, studying in coffee shops and visiting museums and monuments. The National Gallery of Art, the Hirshhorn Museum and The Wall at the Vietnam Veterans Memorial all stand out to Conway as some of D.C.’s finest attractions. Despite the work opportunities, museums and monuments, Conway still finds himself missing home and Lynn. “I miss the debate team; I miss my fellow debaters and my coaches. 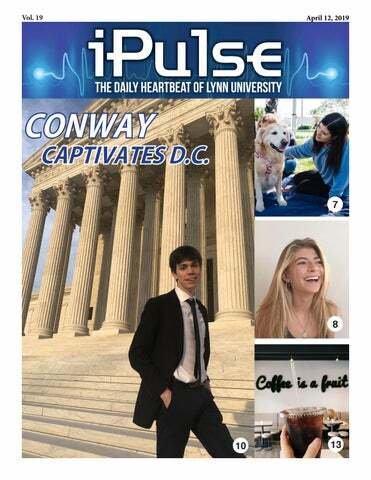 Being captain of the debate team has definitely been the best part of my time at Lynn,” said Conway. “Professors at Lynn, like Dr. Hamm, Dr. Wright and Dr. Stone, have been instrumental in my development, both as a student and a person.” Though Conway misses home and life on-campus, he still values the experience he has gained working in the nation’s capitol. “I think everything you do in life plays a role in preparing you for things that will hit you further on down the road,” said Conway. “Whether that’s something as simple as joining a university club or taking an internship on the Hill.” Going forward, Conway plans to apply the skills and knowledge he has gained in D.C. as he pursues a graduate degree in philosophy following graduation in May. Above: Conway works hard in democratic congressional office drafting memoranda, while interacting with constituents and offering tours of the capitol. Photos/W. Conway. Above: Professor Regueiro works alongside members from the department of student affairs as well as professors from accross campus. LU Photo. Above: R1 Coffee prides itself on not only its delicious foods, desserts, and beverages, but also on the comforting, relaxing atmosphere that it creates and fosters. Stock Photo. Just down the road from campus, R1 Coffee focuses on providing a combination of education, knowledge and hospitality in each product it serves. With an extensive menu, R1 appears to have quality options for all. The Chai Tea Latte, which can be served both hot and cold, stands as one of the most flavorful choices offered. With vanilla flavoring also available, diners have likened the latte to a little sip of heaven. While coffee is R1’s foundation, its pastry and savory section are equally enticing. For instance, the ham and cheese croissant is a fan favorite. The breakfast classic is served extra fluffy and cooked to perfection, offering diners a fresh twist to their morning meal. “I enjoy the friendly atmosphere that R1 has to offer,” said Alexa Juanteguy, sophomore. “I go there often when looking for kind service and specialized coffee.” With a wide range of breakfast and lunch options, including sandwiches, salads and açaí bowls, R1 has become a local hot spot for students. “I go to R1 every weekend for my coffee,” said Halee Bescript, sophomore . “Because I come here so often, they know my order. There is nothing better than going into a place where they know you by name and can easily take your order.” R1 Coffee is conveniently located at 3200 N. Federal Highway in Boca. For more information, visit R1coffee.com. Above: Friendly service and smiling faces add a nurturing vibe at R1. Stock Photo. CONCERNS OVER QUALITY Emails Show FDA Worry After Romaine Outbreaks By CANDICE CHOI Associated Press After repeated food poisoning outbreaks tied to romaine lettuce, a U.S. food safety official shared his concerns in an internal email, saying the produce industry’s water testing “failed in an epic and tragic way.” How the industry tests water to grow leafy greens is “unacceptable” and needs to change, James Gorny, a senior adviser for produce safety at the Food and Drug Administration, wrote to agency leaders. The message last November, obtained by The Associated Press through a public records request, came days before the agency warned people to avoid romaine ahead of Thanksgiving. Just months earlier in April, another E. coli outbreak linked to romaine had sickened more than 200 and killed five. That was later linked to an irrigation canal near a massive cattle lot in Arizona; the fall outbreak was linked to a water reservoir in California. In both cases, regulators never confirmed how the water became contaminated. Though the FDA has publicly called on the leafy greens industry to step up safety, the emails offer a stark view of the agency’s longstanding frustrations with continued outbreaks. They also show how the agency leveraged the crisis to pressure for voluntary changes, even as it tries to figure out its own water testing rules. In a statement, the FDA said it has been working with growers and state agencies to improve safety since the outbreaks, including testing of romaine. The agency said new regulations that include farm inspections and sanitary rules for workers also should help stem outbreaks. Above: Recently, the FDA recalled romaine lettuce following an E. coli breakout. Stock photo. the Silver Medal Award. He also went on a tour of Cambridge, BBC World Headquarters, Facebook London, Instagram Europe HQ and Number 10 Downing Street (British Parliament). From his trip to Britain, Bangura received a recommendation letter to the Watson Institute. As a Watson student, he is using his familiarity with electricity as a focal point. “I realize that electricity is a major issue, especially for students to study,” said Bangura. “I want to see how best I can create something to help with the problem. I think America has the right resources available to me. Here, I’ll be able to utilize even more resources than I did back home.” Now in his second semester at Lynn, Bangura looks to build off of his wideranging experiences in Africa. Via his studies, he hopes to transform how electricity is perceived throughout the continent. was definitely something I enjoyed as a fan,” said Manny Morais, sophomore. “It’s sad to see it all crumble, especially since we didn’t even get to see its ultimate championship game take place.” While the league indicated it will continue to pursue a potential return for a second season, the assumption is that this would be dependent on their ability to rectify its operation in the coming months. For now, though, a plethora of talented athletes are out of work after what looked to be a promising opportunity. Above: The AAF began play on Feb. 9, 2019, just six days after the NFL Super Bowl. League play was suspended on April 2. Stock photos. Above: The Softball team is 10-12 at home. The squad will honor Sophia Devesa and Elizabeth Diaz, their two seniors on Friday, April 19. Game one against the Eagles is slated on Thursday at 3 p.m. Games two and three will take place Friday in a doubleheader beginning at noon. LU Athletic Communications. their dining experience on a daily basis. For many, this service will transform how individuals prepare for the meals accordingly. The BITE app can be downloaded on both iTunes and Google Play. For more information, please visit bite.sodexo. com. Election for the Knights of the Roundtable’s executive board will be taking place on Monday, April 15 in the library from 10 a.m. to 5 p.m. Staff photo/D. Klim. Recently, the Lynn women’s tennis team was named No. 1 in the nation by the Oracle/ITA National Rankings for the first time this season. LU Athletic Communications. 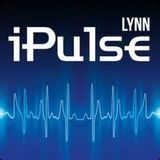 This edition of iPulse was published on April 12th, 2019. Enjoy!